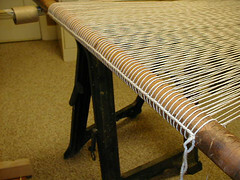 Posted on January 29, 2008	by Linda S.
Jim, over at Creating a Home, has posted a tutorial for warping his Navajo Loom… It doesn’t seem to be as hard as my pessimistic brain imagined it to be. He’s doing rugs on it, but I can see it warped for weaving a large square blanket or a more tender weave for a shawl… I think I may have to have one of these.. This entry was posted in Crafts, Handcraft, Handwork, Historical Textile, Tutorials, Weaving and tagged Crafts, Creating a Home", handmade, Navajo loom, tutorial, Weaving. Bookmark the permalink. well wish me luck, this will be my first, without the in-law who was and expert.